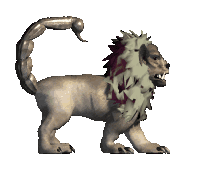 There are several variants of the manticore described in GURPS - one in GURPS Fantasy and a few others in GURPS Dungeon Fantasy Monsters 3 - Born of Myth and Magic. I've always loved manticores, they are perfect fantasic, but not too much, monsters. 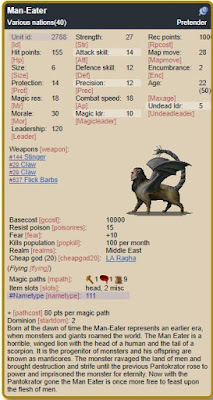 Here I describe four other variants - the D&D manticore that can only flick barbs, a scorpicore from Heroes of Might and Magic III with a venomous stinger that paralyzed its victim, a wingless and poisonless minicore from Might and Magic VII, and the man-eater from Dominions 5 that combines the manticore and the scorpicore and adds some extra scary stuff. Attribute Modifiers: ST+14 (No Fine Manipulators, -40%; Size Modifier, -20%) ; DX+3 (No Fine Manipulators, -40%) ; IQ-2 [-40]; HT+3 . Secondary Characteristic Modifiers: SM+2; Basic Move +3 ; Per+4 ; Will+4 . Advantages: Catfall ; DR 2 (Tough Skin, -40%) ; Discriminatory Smell ; Extra Attack 1 ; Extra Legs (Four Legs) ; Flight (Cannot Hover, -15%; Winged, -25%) ; Infravision ; Night Vision 5 ; Perfect Balance ; Sharp Claws ; Sharp Teeth ; Temperature Tolerance 1 (Hot) . Fling Spikes: Impaling Attack 1d+1 (Increased 1/D Range, x5, +10%; Limited Use, 24 per day, -0%; Rapid Fire, RoF 6, +70%; Reduced Range, 1/2, -10%) . Disadvantages: Bestial [-10]; Hidebound [-5]; Horizontal [-10]; No Fine Manipulators [-30]; Restricted Diet (Carnivore) [-10]. Features: Born Biter 2 ; Tail . Notes: Size 3 hexes; Weight 1,000 lbs. Sharp Teeth (16): 2d+2 cutting (KYOS: 4d cutting), Reach C.
Sharp Claws (16): 2d+2 cutting (KYOS: 4d cutting), Reach C-1. Fling Spikes (16): 1d+1 impaling, RoF 6, Range 25/50. Can launch no more than 24 spikes per day. Traits: Bestial; Born Biter 2; Catfall; Combat Reflexes; Discriminatory Smell; Extra Attack 1; Extra Legs (Four Legs); Flight (Winged; Cannot Hover); Hidebound; Horizontal; Infravision; Night Vision 5; No Fine Manipulators; Perfect Balance; Restricted Diet (Carnivore); Tail; Temperature Tolerance 1 (Hot). Skills: Brawling-16; Innate Attack (Projectile)-16; Jumping-14; Observation-14; Stealth-14; Wrestling-14. Fine Manipulators, -40%) ; IQ-2 [-40]; HT+3 . Advantages: Catfall ; DR 2 (Tough Skin, -40%) ; Discriminatory Smell ; Extra Attack 1 ; Extra Legs (Four Legs) ; Flight (Cannot Hover, -15%; Winged, -25%) ; Infravision ; Night Vision 5 ; Perfect Balance ; Resistant to Poison (+3) ; Sharp Claws ; Sharp Teeth ; Striker (Stinger; Impaling; Cannot Parry, -40%; Long 1, +100%) ; Temperature Tolerance 1 (Hot) . Paralyzing Poison: Affliction 1 (HT; Paralysis, +150%; Follow-Up, Stinger, +0%) . Stinger (16): 3d+1 impaling (KYOS: 5d+1 impaling) plus follow-up poison (resisted with HT; paralyzed for margin of failure minutes), Reach C-2. Traits: Bestial; Born Biter 2; Catfall; Combat Reflexes; Discriminatory Smell; Extra Attack 1; Extra Legs (Four Legs); Flight (Winged; Cannot Hover); Hidebound; Horizontal; Infravision; Night Vision 5; No Fine Manipulators; Perfect Balance; Resistant to Poison (+3); Restricted Diet (Carnivore); Tail; Temperature Tolerance 1 (Hot). This poison is extracted from the stinger of a powerful scorpicore. The victim must resist with HT or become paralyzed for margin of failure minutes. Cost: $720 (singular); $260 (5-batched). Recipe: $72; 3 days; defaults to Poisons-3. Statistics: Affliction 1 (HT; Follow-Up Poison, -10%; Paralysis, +150%) . Attribute Modifiers: ST+9 (No Fine Manipulators, -40%; Size Modifier, -10%) ; DX+3 (No Fine Manipulators, -40%) ; IQ-2 [-40]; HT+3 . Secondary Characteristic Modifiers: SM+1; Basic Move +3 ; Per+4 ; Will+4 . Advantages: Catfall ; DR 1 (Tough Skin, -40%) ; Discriminatory Smell ; Extra Attack 1 ; Extra Legs (Four Legs) ; Infravision ; Night Vision 5 ; Perfect Balance ; Sharp Claws ; Sharp Teeth ; Striker (Stinger; Impaling; Cannot Parry, -40%) ; Temperature Tolerance 1 (Hot) . Notes: Size 2 hexes; Weight 700 lbs. Sharp Teeth (15): 2d cutting (KYOS: 3d+1 cutting), Reach C.
Sharp Claws (15): 2d cutting (KYOS: 3d+1 cutting), Reach C-1. Stinger (15): 3d-1 impaling (KYOS: 4d+1 impaling), Reach C-1. Traits: Bestial; Born Biter 2; Catfall; Combat Reflexes; Discriminatory Smell; Extra Attack 1; Extra Legs (Four Legs); Hidebound; Horizontal; Infravision; Night Vision 5; No Fine Manipulators; Perfect Balance; Restricted Diet (Carnivore); Tail; Temperature Tolerance 1 (Hot). Skills: Brawling-15; Innate Attack (Projectile)-15; Jumping-14; Observation-14; Stealth-14; Wrestling-14. Notes: Size 3 hexes; Weight 700 lbs. Attribute Modifiers: ST+50 (No Fine Manipulators, -40%; Size Modifier, -40%) ; DX+3 (No Fine Manipulators, -40%) ; IQ+1 ; HT+5 . Secondary Characteristic Modifiers: SM+4; FP+10 ; Basic Move +4 ; Per+4 ; Will+6 . Advantages: Catfall ; DR 5 (Tough Skin, -40%) ; Discriminatory Smell ; Extra Attack 1 ; Extra Legs (Four Legs) ; Fangs ; Flight (Cannot Hover, -15%; Winged, -25%) ; Immunity to Poison ; Infravision ; Magic Resistance 3 (Improved, +150%) ; Night Vision 5 ; Perfect Balance ; Sharp Claws ; Striker (Stinger; Impaling; Cannot Parry, -40%; Long 1, +100%) ; Temperature Tolerance 2 (Hot) ; Unaging . Fling Spikes: Impaling Attack 2d+1 (Increased 1/D Range, x5, +10%; Limited Use, 24 per day, -0%; Rapid Fire, RoF 6, +70%; Reduced Range, 1/2, -10%) . Poison: Affliction 2 (HT; Paralysis, +150%; Follow-Up, Stinger and Barbs, +30%) . Roar: Terror (-3) (Hearing; Magical, -10%) . Disadvantages: Bestial [-10]; Horizontal [-10]; Increased Consumption 1 [-10]; No Fine Manipulators [-30]; Restricted Diet (Carnivore) [-10]. Perks: Fur ; Penetrating Voice . Notes: Length 10 yards; Weight 13,000 lbs. Fangs (18): 8d+1 impaling (KYOS: 8d-1 impaling), Reach C.
Sharp Claws (18): 8d+1 cutting (KYOS: 8d-1 cutting), Reach C-3. Stinger (18): 10d+2 impaling (KYOS: 9d+2 impaling) plus follow-up poison (resisted with HT-1; paralyzed for margin of failure minutes), Reach C-5. Fling Spikes (18): 2d+1 impaling plus follow-up poison (resisted with HT-1; paralyzed for margin of failure minutes), RoF 6, Range 25/50. Can launch no more than 24 spikes per day. Roar: When a creature hears the roar of a man-eater, it must roll a Fright Check at a -3 penalty. If a victim succeeds at his Fright Check, he will be unaffected by this ability for one hour. Traits: Bestial; Born Biter 2; Catfall; Combat Reflexes; Discriminatory Smell; Extra Attack 1; Extra Legs (Four Legs); Flight (Winged; Cannot Hover); Fur; Horizontal; Immunity to Poison; Increased Consumption 1; Infravision; Magic Resistance 3 (Improved); Night Vision 5; No Fine Manipulators; Penetrating Voice; Perfect Balance; Restricted Diet (Carnivore); Tail; Temperature Tolerance 2 (Hot); Unaging. Skills: Brawling-18; Innate Attack (Projectile)-18; Jumping-18; Observation-18; Wrestling-18. This poison is extracted from the stinger of a powerful man-eater. The victim must resist with HT-1 or become paralyzed for margin of failure minutes. Cost: $1,440 (singular); $520 (5-batched). Recipe: $144; 12 days; defaults to Poisons-5. Statistics: Affliction 2 (HT; Follow-Up Poison, -10%; Paralysis, +150%) .